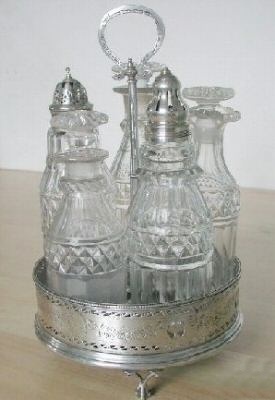 The Italian, French and "Continental" tradition refers to "cruet stand" as the oil and vinegar container, sometimes with salt and pepper shakers, rarely accompanied by spice, mustard or other condiment casters, bottles and jars. 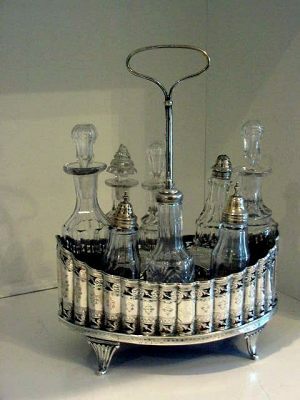 These objects are named in Italy "portaoliera", "ampolliera", "olio e aceto" and in England "Warwick cruet stand", "soy stand", "box cruet stand". Silver examples are, usually, the most valuable under the artistic aspect, but excellent artifacts in ceramic and porcelain still exist. 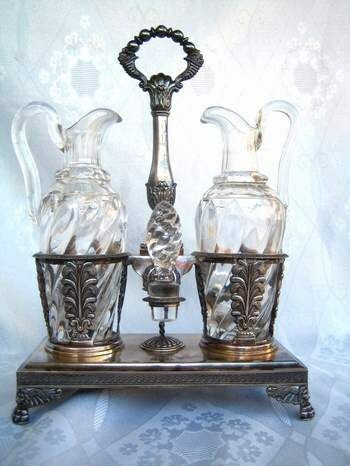 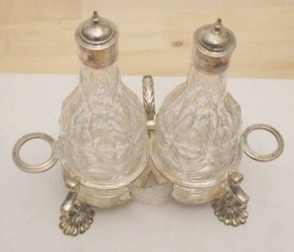 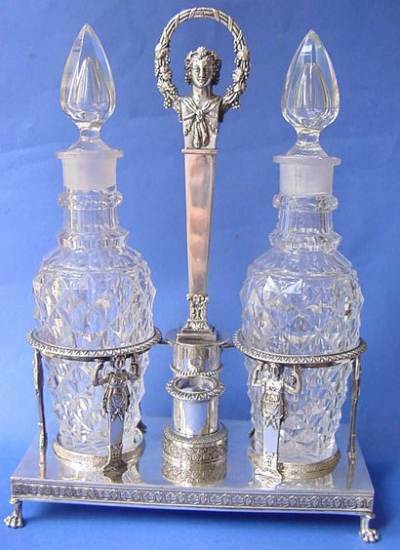 Most silver cruet stands rest on a four footed base with a tall central handle with a ring on the top. 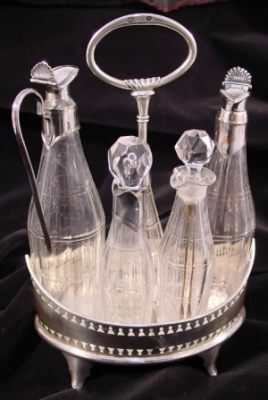 Pierced baskets on each side of the handle are used to contain the bottles, sometimes with a pair of circular supports to lodge bottles' stoppers. 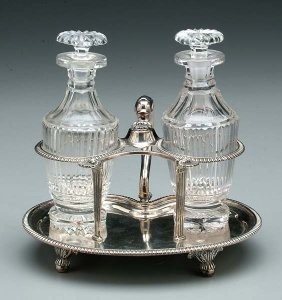 English cruet stands have a larger number of containers (sometimes 8 or more) consisting of bottles, casters and jars and a large variety of condiments used to give a special flavors to food. 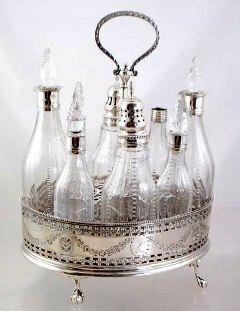 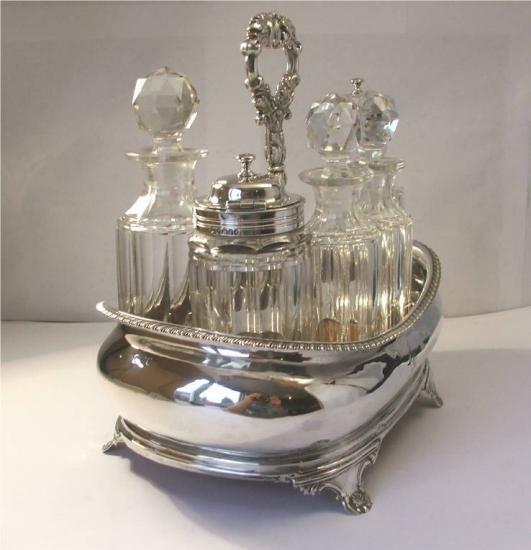 The "Warwick Cruet", takes its name from that one realized by Anthony Nelme in 1715 for the Duke of Warwick (three silver casters and two glass bottles).